Enjoy the winter magic, find peace of mind and feel the powerful movements of a horse when walking in the deep snow. In the beginning we will prepare horses together in the stable and then move to our riding area where all safety instructions are given. After that the trip may begin. After the trip we take care of the horses and enjoy a cup of hot chocolate. You can borrow a riding cap from us, but please wear good shoes and clothes suitable for the day's weather conditions. 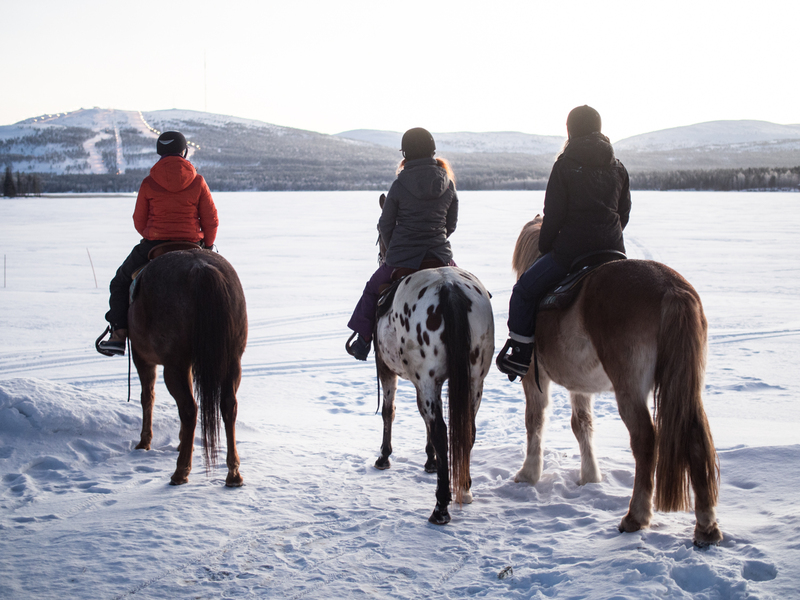 Horseback riding trip takes you through the snowy forest to the beautiful frozen lake Pyhäjärvi. Through the snowy forest to the beautiful frozen lake Pyhäjärvi. Enjoy the winter magic, find peace of mind and feel the powerful movements of a horse when walking in the deep snow. In the beginning we will prepare horses together in the stable and then move to our riding area where all safety instuctions are given. After that the trip may begin. After the trip we take care of the horses and enjoy a cup of hot chocolate. Age limit 12 years.